After I treated the English woman with the refractory severe psoriasis successfully, I started thinking and researching Psoriasis in the U.S.
Psoriasis is the most prevalent autoimmune diseases in the U.S. According to the National Institutes of Health (NIH), as many as 7.5 million Americans—approximately 2.2 percent of the population–have psoriasis. The thing is how this skin disorder affect your life-Nearly 60 percent of people with psoriasis reported their disease to be a large problem in their everyday life. Nearly 40 percent with psoriatic arthritis reported their disease to be a large problem in everyday life. Patients with moderate to severe psoriasis experienced a greater negative impact on their quality of life. In particular, just like my patient, women and the kids with severe psoriasis should live with a great emotional stress because it affects their appearance and have difficult time in going out and having a social activity. Our experience indicates that acupuncture is induced an effective therapeutic modality for psoriasis, particularly when the western medical management is unsuccessful. We speculated about the possible involvement of the cutaneous reticuloendothelial system in the clearance of the skin lesions. The whole article is below. At least acupuncture doesn’t give any side-effects like many western steroid medication-which can be also toxic to your body, moreover this acupuncture can help your immune strength and to relax your mind. And I believe if they are a good amount of the successful cases for psoriasis with acupuncture treatment, and you don’t really see the benefit of the western medical treatment, you should try acupuncture. After my successful psoriasis treatment with the dramatic itch relief and skin color change,; she even felt her sinus congestion cleared, and saying “ I haven’t felt this good for years!”, I now want to help more people with psoriasis who are not effectively responsis to the conventional medicine and also having bad side-effects. Below is the one of the positive research result. New York University Dental College, New York. We treated 61 cases of psoriasis with acupuncture, including 25 patients with complications of joint involvement and two cases with scleroderma additionally. All of the patients had failed to respond to their prior conventional western medical management. 25 patients were males and 36 were females. Their ages ranged from 22 to 84 years, with an average of about 52 years. There was no significant difference of the average ages between the sexes. Most of them (about 61%) had quite extensive involvement of the body. The average of duration of their illness was over 16 years, ranging from two to 65 years. They received an average of about nine sessions of acupuncture treatment, ranging from one to 15. Almost one third (19) of them had eleven to thirteen sessions. With the acupuncture treatment, about one-half (30) of the 61 patients had complete or almost complete clearance of the skin lesions. About a quarter (14 patients) of them had a clearance of about two thirds of the skin lesions. 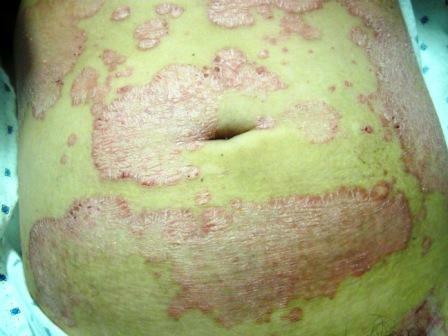 Eight of them had a clearance of one third of the skin lesions. Nine patients had minimal or no improvement. Our experience indicates that acupuncture is induced an effective therapeutic modality for psoriasis, particularly when the western medical management is unsuccessful. We speculated about the possible involvement of the cutaneous reticuloendothelial system in the clearance of the skin lesions. Acupunct Electrother Res. 1992 Jul-Sep;17(3):195-208.